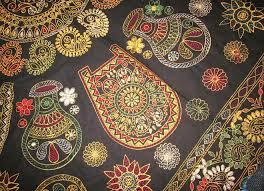 Nakshi Kantha is one of the most glaring examples of enriched Bangladeshi culture.It is a kind of embroidered quilt.The word,”nakshi”refers to artistic pattern.Nakshi Kantha is a traditional craft and is said to be indigenous to Bangladesh and West Bengal. This art has been practiced in rural Bengal for centuries. 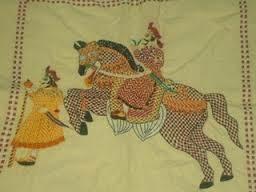 The name,”Nakshi Kantha”became popular after poet Jasimuddin‘s poem ”Nakshi Kanthar Math”,which was published in 1929. 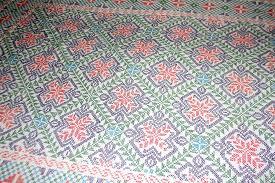 It has a far-reaching effect in the field of Bangladeshi culture and tradition.Where as traditional Kanthas are made for regular use, Nakshi Kanthas are made for special uses.Old or new cloth and threads are used to make these quilts. Mymensingh, Jamalpur, Rangpur, Jessore, Bogra and Faridpur are famous for this craft. Now it is produced commercially and we can find them in many expensive handicraft shops in cities. 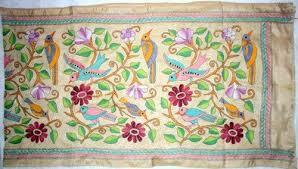 Nakshi Kanthas are in great demand because of the superb colourful designs and patterns embroidred on them. Finally we can say that Nakshi Kanthas signifies a token of enriched Benglali culture and tradition.